One of the most difficult situations I've been in as a clergy person, is consulting with family members as a terminally ill loved one awaits a decision about a medical procedure. Unless there is a living will, or the person has clearly communicated their wishes and expectations, the family decision can be both agonizing and conflictive. Even when the wishes of the ill person are known, the decision can be difficult. As we always hold out hope for miracles for our loved ones, and since we generally want to hold onto them as long as possible, the pressure to do everything imaginable to extend life is enormous. Furthermore, the medical system often encourages our anxiety. Expensive technology and advances in surgical and other techniques beg to be used, even with end of life patients who might prefer to avoid them. Without a patient advocate to say "no," most hospitals will use every option at their disposal to extend care and life, especially if one has the means of paying for it. After all, their business is extending life and they are a business. On one occasion where I was present, the person who was ill had asked not to be resuscitated. He had it in writing. 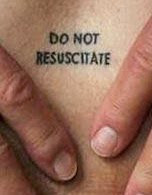 Nevertheless, when his vitals failed, at the insistence of a frightened family member, he was resuscitated! He lived another four or five months, in misery, in nursing care miles from his home, where his elderly wife found it hard to visit. On another occasion, a 91 year old woman had asked that there be no medical intervention of any kind in her dying process. She wanted to die in her assisted living apartment. Her family agreed. But unknowing staff at the facility sent her to the hospital at the first sign of a medical problem. It was only with the intervention of hospice that she was returned to her home, where she died happily, in peace and with dignity. We do violence to our seniors when we don't respect their wishes about their life and death. We do violence to them with our pokes and prods, our tests and treatments, our hauling them here and there, when all they want is some peace and quiet in the presence of those who love them. In my own experience, both my mother and my father took control of their dying experience, with the consent of family members. My father died at home. My mother died at home. One had the aid of visiting nurses, the other of hospice. Both successfully resisted interventions medical personnel wanted, but they didn't. Both embraced death as a part of life. My mother made it seem like she was going to a grand party, where she would see again all those appearing to her from the other world in the last day before she died. In the midst of all the shouting and ranting that some call a "health care reform" debate in the U.S., and especially as we confront the distortion of "death panels," one thing seems certain. We would be better off as a people were we to recognize the natural human processes of living and dying. We should (even if Medicare doesn't pay for it) be making decisions with loved ones about wishes for the end of life. And we might work harder to keep from doing violence to those who are dying.